Hi Alex. Just about squeezed under the wire with this entry. 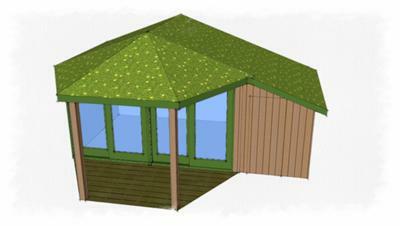 I asked the readers of Shed Building Monthly what they thought of my original design and I received an avalanche of great advice. I have tried to incorporate all the readers' suggestions into one design. You and they are the judges of how successful I have been. The green shed roof is popular Uncle Wilco, Ben Ellis, Paulbry all thought a green roof would help on the environmental front. 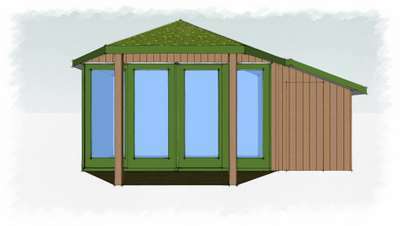 It also helps by giving a bit of thermal mass to the shed which probably helps in the hot weather we are having at the moment. The main benefit for me is the boost it gives to birds and insects by having another habitat in the garden. Natural light was thought to be an issue so I have made a whole wall glass so you can also get a good view of the garden. (Maybe good, maybe not so good as you will also be able those urgent gardening jobs you could be doing!). Wood slatted blinds could be used to reduce solar glare on your computer screen when the sun is at a low angle. would also accommodate a doormat to reduce internal mud! It is also a great place to sit out and chat with your visitors during nice weather such as we are having at the moment. 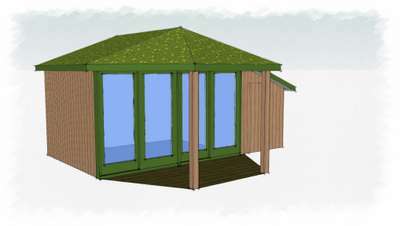 The lean-to stays as you can 'never have enough storage' and you will also need somewhere to store the garden tools, however, the roof is integrated into the main shed to make the roofline cleaner. There was also a suggestion that a toilet could be incorporated. Mains drainage could be a problem so maybe the 'long drop' or a composting type could be considered! We didn't really progress too far with the internal design the main suggestion for space saving being the use of shelves at eaves level for the cider press and other bulky items. Heating could still be electric under-floor heating or a couple of people were keen on using a wood burning stove (though we would have to pay close attention to flashing details around the chimney in the detailed design). I still like the solar air heater/dehumidifier. For security, a WiFi CCTV camera focussed on the door would catch any intruders in the act. You could also have this set up to alert you on your mobile phone if you could cope with all the false alarms. There we go, I hope that people find this an improvement over the mark 1 version and not the result of design by committee. I think you are onto a winner there John. Standing ovation everyone, what a winner.